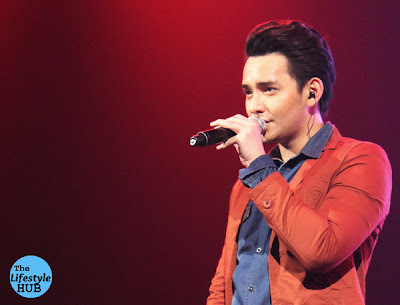 Prince of Teleserye theme songs Bryan Termulo showed his full potential in his much awaited solo concert held at Music Museum on March 9. GMA Network's "Pinoy Pop Superstar" season 3 finalist Bryan Termulo started a sensational career early in 2007 and soon released a self-titled debut album titled "Begin" when he transfered to ABS-CBN ans started singing theme songs for ABS-CBN teleseryes. After singing three teleserye theme songs, “Bihag,” "Pagdating Ng Panahon,” “Hanggang Ngayon,” “Dadalhin,” and “Kailan” for ABS-CBN’s most successful teleseryes “Walang Hanggan”, “Dahil Sa Pag-ibig”, “Kung Ako'y Iiwan Mo”, 100 Days to Heaven”, and “Ina, Kapatid, Anak”, respectively, he earned his tag 'Prince of Teleserye theme songs.' Aside from singing, he has also ventured in acting on TV. He has proven himself in his first appearance on TV in Aljur Abrenica-Kris Bernal starrer "All My Life" on GMA Network and on the succeeding ABS-CBN TV series "Wansapanataym," "MMK," and "Budoy." He may be not the grand finalist of the singing competition he was discovered, Bryan worked harder for his name and established his name as an OPM artist. His rendition of Regine Velasquez' hit "Dadalhin" which really put him to where he is right now. Talking about the concert, he opened it with a very energetic opening song and dance number. Nevermind the front acts. Anyways, in his debut concert, he showed how versatile he was and what he can do. He's not just another balladeer on stage, he can also do pop and do sing and dance. Anyways, his best performance of the night (fonr me) is when he sang Jason Mraz' "Word Play." His rendition was fantastic! Guest performers at that night are Liezel Garcia, Bugoy Drillon, KZ Tandingan, Melissa Cantiveros and the surprise guest Angeline Quinto. His celebrity crush Sarah Geronimo surprised Bryan with a video greeting.